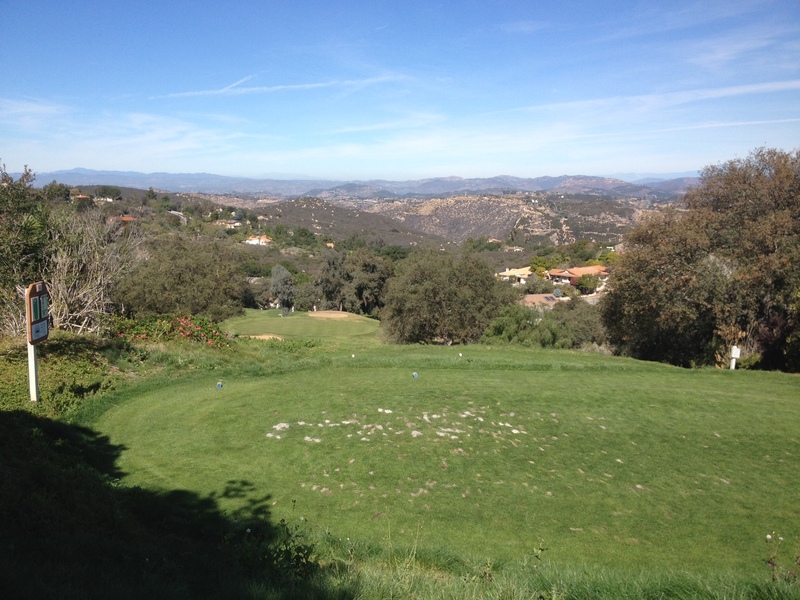 First, the bad news about the par-3 4th at Meadow Lake Golf Club in Escondido: This is where play backs up. The good news: You won’t mind. This hole is as much a joy to look at as it is to play. No. 4 plays to 176 yards from the back tees and 160 from the blues, but the significant elevation change makes it play significantly shorter. The yardage book says one to two clubs “under normal conditions,” but it played to three clubs with the wind behind us the first time I played it. That meant I reached with an easy 9-iron. The next time I played it, however, the wind was coming from the right and a smooth 8-iron found the front left trap. I’ve played it three times now and it hasn’t played the same twice. That’s part of the fun of this hole, which I’m told used to play to a par-5 – using what’s now the No. 5 green – but it was changed to a par-3 to spare homeowners from errant tee shots. Meadow Lake is uniquely situated with views of the San Bernardino and San Jacinto mountain ranges. That makes for several stunning vistas, but none are better than what you see off the tee at No. 4. While the tee shot is a bit of a guessing game – fyi: there’s ample room short and left – it’s only half the battle. I have yet to par this hole despite three great chances. The green is deceptively slippery, with putts moving right and being unexpectedly quick. It’s tough to prepare for if you haven’t played here previously. I’ve decided I’m going back until I make par or better here. Southern California is blessed with a bevy of fun elevated par-3s. Add Meadow Lake to list of those check out. I’m banking par will elude you at first and you’ll want to come back, if not for the score then for the view. This entry was tagged escondido, Meadow Lake, mountain ranges, par-3, San Bernardino, San Jacinto. Bookmark the permalink.